We live in the era of social networks, all we do we like to share, not only with our friends at Twitter, also in a more personal contact with our staff. Therefore Scale has appeared in Cydia, for letting us share the song you are listening by email, iMessage, Twitter, Facebook, or simply copy it to the clipboard. Just press the Share button in the music app. Facebook sharing option is available only in iOS 6 as twitter and facebook using share options built into the system itself. Or add a song to a playlist. 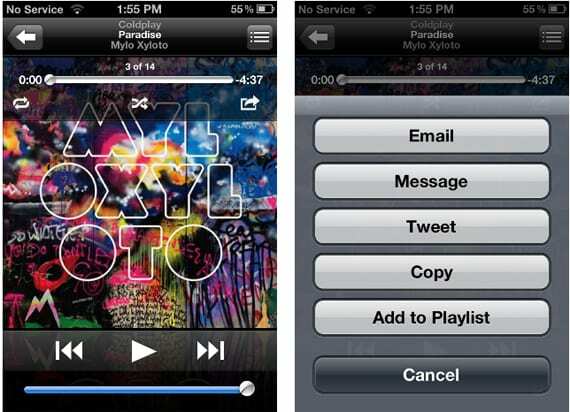 Article Scale: share what you're listening by email or social networks (Cydia) was originally published in News iPhone .